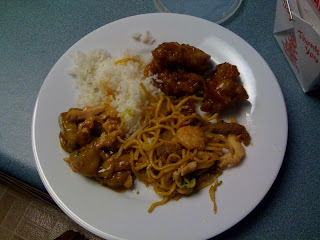 Yesterday, however, we got some Chinese food from Szechuan House and it was great! Lucky for us, it's super close to our house and they deliver (I refuse to do carry out because it's literally RIGHT next to my gym and I don't feel like being overwrought with guilt before dinner). My absolute favorite item was the Chicken with Egglant and Garlic Sauce (Large: $7.50 and it was seriously huge). The eggplant was almost caramelized and I loved the flavor of the sweet garlic sauce. I would definitely order this again. In fact, this is probably going to be my go-to dish. The General Tso's (Large: $8.50) was good - but I couldn't eatmore than three pieces since the sauce was so sweet, however, I did like that there was a good ratio between the breading and chicken. Dan thought it was excellent and he finished it off happily. The Lo Mein with mixed meat (beef, chicken and shrimp) (Small: $4.50) was also good, and surprisingly not at all oily. I usually like more vegetables in my Lo Mein, but since Dan ordered this one - he was thrilled to see so much meat. The selection at this restaurant is fabulous and so are the prices. We ordered all this food for 4 people, and there was so much leftover! If you're in the area - definitely check out the Szechuan House! they have a great "traditional chinese" menu as well. Also, I love their aromatic squid. it's like calimari with extra zing. Matthew - Thanks for letting me know :) Did you go to Talara yet?! Red Bean Ice Cream!?!?!?! OK, I better not get delivery all the time then! You can't write a proper review of this place unless you actually try the more diverse options on the menu. its the equivalent of reviewing a sushi restaurant by only trying the california roll and the shrimp tempura.